I found these in my files... I certainly didn't take them- Enjoy! LOL, the forum is getting bombarded by Day-twah! These are some nice finds! Don't even get me started on the Ren Cen though!! The gap between the Ren Cen and the rest of the skyline will be partially filled by the 25 story UDM Residential Tower. However, at 25 stories, it will still be dwarfed by the 72 Floor Ren Cen. Perhaps the best way to balance the skyline is to build more towers west of the CBD, down by Riverfont Towers. I'd not a big fan of the current unbalanced skyline, but quite a few people actually like it the way it is. As nice as the Ren Cen may or may not look (depending on who you ask), the building has been a disaster from the begining. It is separated from downtown by Jefferson Street, which is about 10 lanes wide with a center median. Additionally, it cuts off downtown from the Riverfront. The building would have been much better (and wouldn't look quite so monstrous) if it had been built back more from the river. The Ren Cen used to have berms in front of the building on Jefferson, which further cut the complex off from downtown. This was a response to the violence in the city at the time, although the berms had been criticized from day one. The entire complex was built like a fortress, and it is very confusing inside, although GM has made it better with the addition of a circulation ring on the second level. The construction of the building left a huge glut of office space in the market, leaving a high vacancy rate for ten years while all the office space was absorbed. In fact, because of the glut of office space, the additonal "baby towers" were never constructed. 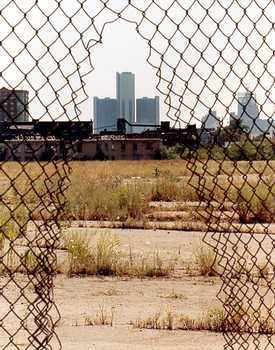 GM bought the Ren Cen in 1996 for $73 Million, well below the original construction cost of $337 Million in 1977. However, as part of the deal, GM is making nearly $500 Million in improvements to the building. Didn't realise that the RenCen (is that what the locals call it? - I feel like one It makes sense to refer to it as such too) sat so prominently on a river....and such a wide river too. Hope there are some tunnels underneath as the suspension bridge would surely not be enough. The 4 towers surrounding the uhhhmmm, RenCen make it look more like something sitting in Brasilia rather than in the U.S.., esp in the 2nd last pic. Thanks for the lowdown on the RenCen and its surrounds Allan. Day-Twah is how Detroit was originally pronounced. Obviously, that has changed since. BTW, I have always said that the Renaissance Center looks like it's giving Ontario the finger. Another screw up in design. Technically the Detroit river is not actually a river, but a straight. In French, Detroit means "The Straights". Detroit was orignally settled by a French fur trader by the name of Antoine de la Mothe Cadillac in 1701. Today all that remains of the city's French history are French street names, such as Lafayette, Beaubian, and St Antoine. The border crossing is very congested. There are currently only two crossings, the tunnel at Randolph Street, right next to the Ren Cen, and the Ambassador Bridge in southwest Detroit. The bridge is used almost entirely by semi trucks. It can take hours to cross the bridge, especially during peak hours. The delays for the tunnel aren't as bad, but it can still take upwards of an hour to cross the border if you go at the wrong time. There is a train tunnel as well. They are looking to turn the train tunnel into a truck tunnel to help relieve the congestion on the bridge. Additionally, the owners of the bridge are looking to either add on to the current bridge, or build a new bridge adjacent to the Ambassador. Also being looked at is a new bridge further downriver, although the people living in the area are upset because they do not want all kinds of trucks passing through their neighborhood. Locals do refer to the Renaissance Center as the "Ren Cen". Nobody here really wants to say the whole thing...we're lazy Americans. LOL. The cement silos that exist on the riverfont seem to be the inspiration for the Ren Cen with the way the towers are clustered together. The city wants the silos to come down, although I don't mind them. The problem is that they are in the way of the city's new riverfront park. They are trying to get the companies to relocate elsewhere in the city, but so far that has been unsuccessful, so the city wants to paint some hideous looking murals on them. What is it with this city and murals? We've already got a 30 story high mural on whales on the side of Broderick Tower. What do we need another one for? Here you can see the riverfront, complete with cement silos. In the middle of the river is Belle Isle, where I took my nightime skyline shots from. Here is an artists rendering on what the silos could look like if they actually did paint a mural on them. No!!! Not a mural of sea creatures AGAIN! LOL. It looks like I took a little too long to type out my post, lol. Wolverine beat me to it. Technically the Detroit river is not actually a river, but a straight. In French, Detroit means "The Straights". ...so the city wants to paint some hideous looking murals on them. In French, "the straights" is spelled "des droits." You can easily see the etimology there. I didn't know that BTW. I hadn't ever thought about Detriot's French heritage as it was a part of French territory during the colonial days. Interesting. That mural is hideous. They should pain a mural of silos on them. Also, by baby towers, do you mean a 3rd ring of towers? Like, and addional set around the existing second row? I don't have the renderings with me, the additonal "baby towers" would've been built in a cluster of 6 just east of what has been completed. They would've been similar in design to the building that EDS moved into (like the towers to the right of the main cluster). I wasn't going to post these, but why not? 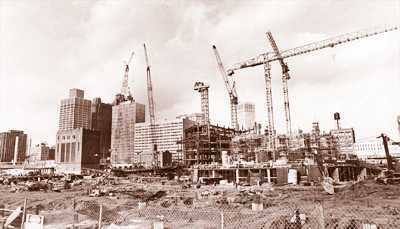 The Renaissance Center towers were beginning to take shape in the summer of 1975. A giant drill digs holes for caissons that will support the towers. Workers inspect a hole that will be filled with concrete and steel to support the towers. Workers raise plastic panels that resemble concrete that will line the outer walls of the base of the center. The interior of the 70-story Plaza Hotel in September of 1976. By May of 1976 the towers had already drastically altered the city's skyline. This photo looks west along Jefferson Ave.
By February of 1977, the project was already reaching for the sky. The Jefferson Ave. entrance to the Renaissance Center. One of the shops in the Rencen. Visitors tour the grand opening of World Shops in the Rencen in March 1978. A view of the Rencen from across the Detroit River in Windsor, Ont. On second thought, I am going to post this too, as long as we are on the topic. It is relatively long, but it's a very interesting read. The 1967 riots left Detroit burned and battered. While many gave up hope, and some tolled the city's death knell, a group of businessmen were coming together to find a way to save it. Detroit Renaissance was bom in 1970 out of a gathering of 26 business, industrial, and civic leaders dedicated to stimulating an economic boom in Detroit. The following year, on Nov. 24, 1971, Henry Ford II, the head of Detroit Renaissance, announced plans to Mayor Roman Gribbs and the Detroit City Council for a $500 million development that would include hotel, office and residential space on the riverfront. It would be the largest privately financed project in the world, to be built east of Ford Auditorium and Cobo Hall. John Portman was named as the architect. Portman had created the Peachtree Centre in Atlanta as well as the Embarcadero Center in San Francisco. Hope was high for, as Roman Gribbs put it, "a complete rebuilding from bridge to bridge," a reference to the area between the Ambassador and MacArthur bridges. It was not the first project the Fords contributed to the Detroit riverfront. Ford Auditorium, funded by contributions from the family, was built in 1956 to house the Detroit Symphony Orchestra. Now four 39-story office buildings and one 70-story hotel -- Michigan's tallest building -- would join the auditorium. City Council approved the plan on May 3, 1972, with some dissent from other developers who complained that the development would poach tenants from other downtown buildings and cause more blight. Ford Motor Co. announced a contest Jan. 2, 1972, to name the project. The winner was Roger Lennert, a 29-year-old writer in the public relations and advertising department of Ex-Cell-0 Corp. Lennert's "Renaissance Center" beat out such other suggestions as the Bellevue Center, Great Lakes Center, Heritage Center, Jefferson Center, Mariner's Landing, Place Riviere, Rivergate, Skyline Center, and Waterway Plaza. There were 141,537 entries from Wayne, Oakland, and Macomb Counties. Motor City Plaza and The Hub were the most popular entries at 542 submissions each. Close behind was the Motor City Center with 536 entries. The "Ford Development" now officially became The Renaissance Center. Detroit's waterfront in 1972 before construction of the RenCen began. Investors in the project included General Motors, American Motors, Chrysler, S.S. Kresge, Federal Mogul, Burroughs Corp. and Budd Company. Together they had contributed more than $33 million, which was to provide the down payment for the $200 million first phase. Eight Detroit schoolchildren, Nancy Wack, Peter Fisher, Adam Lobenthal, Sheryl Miller, Susan Starks, Daniel Neusen, Mary Beth Cobbs and Larry Detloff, turned spades of earth at the site of the first phase, at East Jefferson and Brush. By December of 1973, the Western International Detroit Plaza Hotel, still just a hole in the ground, had booked over 100 commitments for big blocks of space starting in 1977 and running into 1981. Western International also had invested $4 million of its own money in the Renaissance Center. The first large convention was scheduled in 1973 for March 1977. Meanwhile at the construction site, workers from the Detroit Historical Commission, Plan Commission, and Department of Public Works were removing brick, cobblestone, and granite paving from the area to redistribute to historic areas of the city, including the West Canfield Street District, Christ Church on Jefferson, and the Moross House on West Jefferson. Property values in the area had increased by the end of 1973. Demand was high for nearby buildings, both the older office buildings and manufacturing sites. 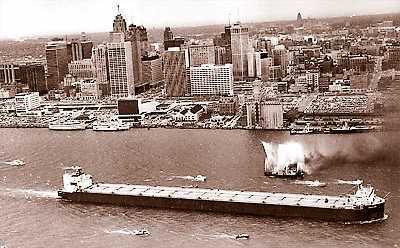 The Detroit-Windsor Tunnel approach was relocated, and its original location deeded to Ford Land. The University of Detroit announced a multi-million dollar expansion of its Downtown Law School campus, and the adjacent Sts. Peter and Paul Jesuit Church. 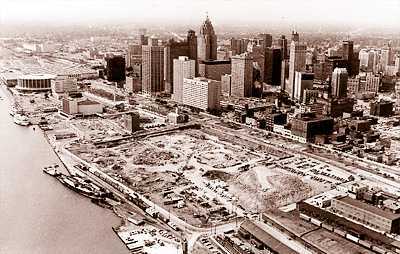 The site of the Rencen between Jefferson Ave. and the river is cleared in the early stages of construction in 1974. 7,000 construction workers were working on the project. Between 325,000 and 400,000 cubic yards of concrete would be poured, enough to form a solid concrete block the width and length of a football field to a height of 22 stories. 1,100 caissons would be dug about 100 feet down. Forty thousand tons of structural steel would lift the first phase of the structure. Two million square feet of glass would encase the five buildings. One aspect of the construction drew the most criticism. From the time of their rise off Jefferson, the huge concrete abutments that housed the heating and cooling operations of the RenCen were controversial. Many saw them as fortifications -- a barrier to protect the rich business interests inside from the poverty outside. Another controversy arose when a Renaissance realtor was accused of trying to poach tenants of the Buhl Building. A lawsuit charged a salesman for the Renaissance Center with going door to door in the Buhl building soliciting tenants to lease space in one of the four towers. Apparently several of the Buhl tenants complained. By January of 1975 the foundation was beginning to take shape. There were celebratory moments during construction as well. On June 25, 1975, four women were served a gourmet meal in what would become the Celebration Room of the Detroit Plaza Hotel. Silver table settings, chilled champagne, and Rock Cornish game hen graced their table as bulldozers roared nearby and huge cranes raised tons of steel girders into place. The ladies and waiters wore hard hats. The four had won the luncheon with the winning bid of $96 in the Channel 56 auction. The luncheon was prepared by Jacoby's, the oldest restaurant in downtown Detroit, and served in the newest. By 1976, the offices were partly occupied. Though the official opening would not be until March of 1977, fans and critics were already weighing in. General Motors executive Henry L. Duncombe said the Renaissance Center would be a valuable trigger for Detroit. He saw a reversal of the population and business exodus over the next five to seven years. John Portman, architect for the project, said, "We can build great and wonderful things. But physical things alone will not cause the city to return to a state of vitality." Everyone agreed that there must be "spinoff' in order for the salvation of downtown to be realized. At this point, the most obvious effect was an unrealistic jump in property prices. On the afternoon of Friday April 15, 1977, 1,000 spectators cheered as Henry Ford II and Detroit Mayor Coleman Young unveiled a plaque commemorating the private investors whose funds made the project possible. Ford said, "Detroit has reached the bottom and is on its way back up." The mayor read a telegram from President Jimmy Carter who said he hoped the project would "live up to its expectations." Also attending was Elio Gabbuggiani, mayor of Florence, Italy, Detroit's sister city. As the birthplace of the European Renaissance, Florence seemed an appropriate co-celebrant, even though Gabbuggiani, a communist, had difficulty getting a visa. By November the buildings were on their way up. That evening 650 business and society leaders gathered at a lavish benefit celebrating the formal dedication of the Renaissance Center. The money raised from the $300-per-couple tickets went to the Detroit Symphony Orchestra. The gala was co-chaired by Mrs. R. Alexander Wrigley and Mrs. R. Jamison Williams, who, an hour before the ball, received a phone call from Henry Ford II who said he was unable to attend the reception. Moments later, Christina Ford, Henry's estranged wife, cancelled her table. The event went on without them, perhaps a little spicier for the gossip. Detroit News Society Editor Eleanor Breitmeyer described the evening: "The Renaissance Center served as a backdrop for the most lavishly gowned, furred and jeweled crowd assembled in Detroit history. Women wore rustling silks, and romantic, drifting chiffon. Diamonds, emeralds and rubies were brought out of the bank vaults. One guest had a diamond necklace she said was insured for $500,000. Another sparkled with a pair of 18-carat drop earrings. Industrial giants that one never sees at fund-raising parties turned out. The Italian mayor flirted with the women, but noted that, 'Florence is much smaller and nicer than your city,"' not perhaps the most felicitous conversational gambit in the circumstances. The entertainment for the evening was Bob Hope, who kept the diners laughing. And so the Renaissance Center rose up on a hopeful note, with much good will and a tantalizing future. 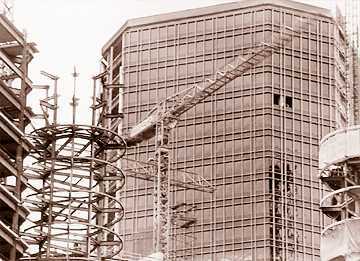 Two more office towers were built and opened in 1981, called Phase II, occupied and eventually purchased by ANR. Stores came and went in the original buildings -- from designer boutiques in the early days to more prosaic tourist shops and everyday supplies for the office workers. Mayor Coleman A. 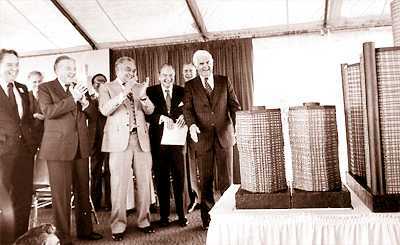 Young (in light suit) and Henry Ford II, to the mayor's right, join business and community leaders in applauding an edible version of the RenCen at a celebration of the project's completion. In 1978, Mayor Coleman A. Young and the Downtown Development Authority invited a team of architects to give their professional opinion of the Renaissance Center. Their study was critical of many of the design features, especially the resulting isolation. The study also was critical of the city's poor riverfront planning and lack of planning in general. A later study was critical of the high retail vacancy rate in the RenCen. On the architect's web site today, The Renaissance Center is notably not among his list of "Achievements/"
Phase III, the residential development, was left by the wayside, as Detroit's population continued to leave the city throughout the 1980s. In 1982, the city measured the population of the central business district as 37% lower than in 1970. By 1983, the RenCen was in default in its mortgage payments for the second time, and the four insurance agencies that bankrolled the construction, along with Ford Motor Credit, assumed 53% ownership. Ford Land retained about 30% and the original limited partners 17%. In 1984, the Chicago-based Rubloff Company took over management of the building from Ford Land. In 1987 the elevated-rail mass transit People Mover, many years in the building, began operation, with a stop at the Renaissance Center that soared over the forbidding concrete berms. Finally, in May of 1996, General Motors announced that it was buying the Renaissance Center from then-owner Highgate Hotels in Texas for $73 million, and would spend up to $500 million in renovation costs. Today GM's logo is up on the hotel tower, now owned by Marriott, and the berms are being dismantled. A new era is beginning for what was once a beacon of hope for downtown Detroit. So these were the Phase 3 towers that were never bulit? Do you think that this new era might encourage the construction of these residential towers? No, those are the phase two towers. The phase 3 towers would've looked just like the phase 2 ones, however. There would've been either 6 or 8 of them. I cannot remember off the top of my head. I really need to get the renderings, but I'll have to have my brother email them to me, since they are at home. Phase three will never be constructed. GM is planning a new office building for the area they would've been built on. The new office building is called River East, and it will house GM offices, as well as some offices for Compuware. It is only 10 stories, but it looks like a nice building. The rest of the area will be devoted to residential and retail use, as well as parks. It will probably be some sort of new urbanist-type development. I have seen some renderings, and it looks like they are planning for about 3-4 stories, maybe 5, depending on demand. There will also be some midrise residential towers mixed in. This whole development is part of Detroit's riverfront revitalization project. I see.... Is this new office building going to be built closer in to the rest of downtown? Also, is RenCen's occupancy rate today relatively high? The new office building is going to be constructed on the east side of the complex, further away from downtown. That's ok though...the city needs taller towers to fill in the gap. 10 stories just isn't going to cut it. The new Port Authority terminal is supposed to be costructed just to the west of the Ren Cen. They had the groundbreaking back in June, but haven't done any actual work on the site yet. That is not surprising though, because this is Detroit. It is supposed to be open for the 2005 shipping season, but I think we'll be lucky to see it open for the 2010 shipping season. Maybe they'll start on the the P.A.T. once they are finished with Post Broadway (the six story bar that has been under construction since 2000). LOL. I have no idea what the occupancy rate of the Ren Cen is. I know that it's much higher now than it used to be. I bet it's almost full. After all, if it wasn't full, why would GM need to build another tower? It's pretty full from what I've heard Allan. The RenCen design-wise is pretty good for a mid-70s designed project. lol @ Bob Hope, that American institution. The bright splish-splashing fishy mural for the silos - hrmmmm. Living in a port city, I see them often and how they are "jazzed-up" and turned into funky apartments or painted with murals on the harbour's history. They seem to work in more subdued colours. I guess they're trying to blend the Detroit silos in with the blue skies beyond. As such, they will obviously stand out on the overcast days though. Kind of hammer it home that it's grey skies. It's almost always cloudy in Michigan. If they really wanted the silos to blend in, they'd leave them the current cement gray color. I finally found it! This was the original proposal for the Ren Cen. The original Renaissance Center proposal looks really neat. Why were some aspects (Phase 3) of the proposal never completed? i dont think ALL of that in detroit wud look good, and i dont get how that wud fit in either. it doesnt look to good either. all the other skyscrapers are wimpy compared to the center of the ren cen, and there al guna be in a shadow [email protected]! It was because of a lack of demand for office space downtown. The Ren Cen had so much office space that it put a glut of space in the market for 20 years after it was built. The downtown office market didn't recover until about 1990. Even today the office vacancy rate downtown is hovering around 25%. wow, thats high, is it because companies are moving out of downtown/to other cities/or just a lack of population support? It is a very complex issue. A lot of companies moved out of the city with the people in the 1960s and 1970s. From 1950 to 1980, the population fell from 1,849,568 to 1,203,339. The Ren Cen was designed to bring people and jobs back into the city. Unfortunately, it didn't really work. The complex was plagued with high vacancy rates from the begining. Meanwhile, highrise office buildings were being built out in the suburbs, in Southfield and Troy. Southfield grew to the largest office market in Michigan, followed by Troy as the second largest, and Downtown Detroit as the 3rd largest. Metro Detroit is the most decentralized metro area in the country. Most people do not commute from suburb to city, but rather suburb to suburb. This makes for some nasty traffic! The roads were designed to bring people in and out of the city of Detroit, not from suburb to suburb. Just to show you how decentralized metro Detroit is....of the metro's 17 (or is it 18?...I can't remember) fortune 500 companies, only one of them has its corporate headquarters in the city of Detroit! Right now vacancy rates downtown are remaining the same, since just as many companies are moving out as moving in. The downtown office market is expected to rebound soon though. Part of the problem with attracting companies to downtown is that most of out buildings were built prior to 1929. Old buildings don't have all the features companies are looking for, and they tend to have small floors. Most companies today want large open floors. So while overall vacancy rates are arounf 25%, class A office vacancy rates are only around 10%. I hope this answers some of your questions...I could go on and on forever! Maybe I just need to write a book or something, LOL. you answered it very well, thanks a lot. Uhh KoRn, the Ren Cen is already built... But I'll agree that it's not that attractive, save for the middle tower. Edit: If you wrote a book, Allan, I would certainly read it. If the Renaissance Center were to ever be slated for demolition, I wouldn't lose any sleep. I despise the original design. Where at all is that building urban? If that would have been built, it would have been murder to the downtown. I'm glad GM is fixing up the RenCen because it needs it. Obviously the design above would not be acceptable to todays standards. However, even after the renovations, and the dust is cleared, I'm sure people will still look at it negatively.